An interview with Kiara Fontanesi. When Motocross speaks to women. She already knew what she wanted when she was three years old, when her father gave her her first motorcycle. 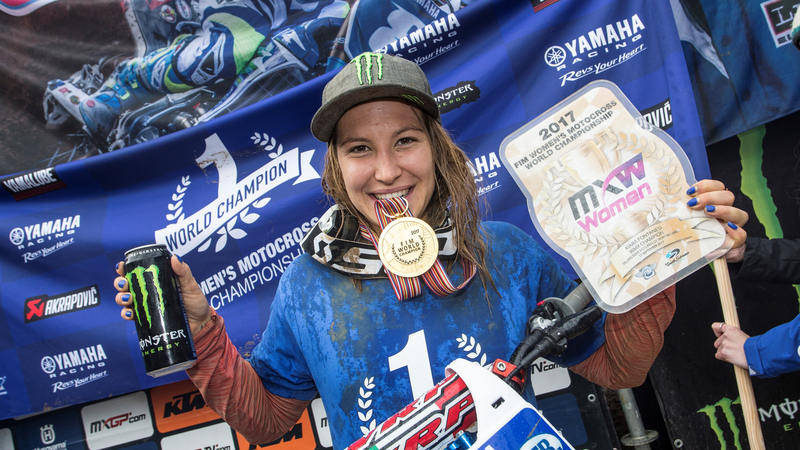 Born in Parma in the heart of the Motor Valley, Kiara Fontanesi, born in 1994, has won the Motocross women's world title five times; in 2012, 2013, 2014, 2015 and 2017. A few days after the last date of the season, from September 29th to 30th at the Enzo and Dino Ferrari Autodrome in Imola, where she won her sixth world title, the Emilian champion talked to the organisers of Motor Valley about the origins of her passion, when it became a real job, going to current events with sports commitments and revealing some of her very ambitious future projects. The beginning and the passion behind it all. Ciao Kiara e grazie per questa intervista. Partiamo subito con la prima domanda che riguarda i tuoi inizi sportivi. Puoi raccontarci da dove è cominciato tutto, la tua prima volta con le moto e quando hai capito che per te questa passione si poteva trasformare in un lavoro? Hi Kiara and thank you for taking the time to do this interview. Let's start off with the first question regarding the beginnings of your sporting career. Can you tell us where everything started, your first time on a bike and when you realized that this passion could be transformed into a job for you? Kiara: "My father bought me a motorcycle, a Yamaha Pw 50, and as soon as I saw it I got on the saddle and from there it was love at first sight. I was three years old. I was the mascot of the paddock my brother Luca ran, and our whole family used to go and watch him. So one day, Massimo, my father, took the bike home for me. I had an innate passion, which I did not even know I had from such a young age. Everything started on that day. Later on, when we went to the world championships I understood that it could become a job. It was a gradual thing, without my noticing it. And now here I am ". Was being born in the Motor Valley an important factor for encouraging your passion for engines and in your case for bikes? Kiara: "The Motor Valley is wonderful. In Emilia-Romagna there you can feel the passion for engines. And as well as being the home to many drivers, our area has created works of art, legends like Ferrari, Ducati, Lamborghini and all the other brands, including Dallara which is in the province of Parma. Being born in this fascinating context, of stories, engines, brilliant men, certainly helps ". Could you tell us about an anecdote from your career that you think was an important factor for your career? Kiara: "There are certainly many anecdotes, but I do not have one in particular that stands out. Definitely being close to my family has helped my growth and supported me in difficult times and have been there since day one. And passion, of course, is essential to always give the best performance ". What does the Motor Valley represent for you today from a sporting point of view and as a motorcycling ecosystem? Kiara: "The Motor Valley as I mentioned before is wonderful and important. Here we have everything, it is a land filled with inspiration, geniuses, champions and mythical and fascinating brands. There are many companies working in the world of motorsport. We have it in our DNA and therefore it is only right to enhance it and make sure that the motor ecosystem can develop further. From my sporting point of view I would say: I was born there, I took my first steps on the tracks of Emilia Romagna. We have many beautiful, equipped facilities ". What potential does this Land of Motors have and how do you think the knowledge and passion of the sector can be passed on to new generations? Kiara: "This land has great potential and is full of passion, inspiration, legends like Enzo Ferrari and Dallara himself. As well as all the great industrialists and pilots we have. Perhaps to excite future generations we should also tell them these success stories. I think in that way, by studying the champions of sport and motorsport passion would naturally follow. Here we have so many facilities, cross-country tracks, speed. We should create a project to attract young people, who are perhaps, in general, less passionate than the youngsters of the past years ". You often hear about Riders Land, why do you think so many talented drivers were born or trained in this region? Kiara: "Because here in Emilia-Romagna engines are part of the culture. We were born with this passion and many champions were born in this land. Of course, besides the talent of the individual, they flourished here thanks to structures, tracks, teams, which definitely made the difference "
The world final at Imola and ambitions outside of sports. Coming back to today, how is the preparation for the final going? Are you happy to run in Imola on a new track where you can become (fingers crossed) world class champion? Kiara: "Racing in Imola will be something magical. It is a legendary track, the temple of speed that for the first time is hosting a GP. The organizers have done a great job and I hope to reciprocate in the best way. On my part there is a race to be ran and I will do my best to do well. As far as the ranking we see how things are by the end of the two heats: first I have to race and pass the checkered flag. Surely there will be pressure, but by now I am used to playing a season in the last round. We'll see. In the meantime, I will enjoy every second of this GP and the public, which in Italy is always top ". After this weekend, however it goes, can you tell us about your next professional commitments and how you see your future ... will you race until you’re 40 (we hope so)? Do you have any ideas for the future outside of sports? Kiara: "After the world championship there will be the last Italian test. Then I'll take a break and then we'll think about the new year. I'm definitely not going to race until I’m 40 - (laughs) - and I honestly never thought about what I'll do afterwards. But alongside my family, friends and sponsors, I’m working on a new Academy for promising fast and talented girls who want to race ". Ok Kiara, we have come to the end of this interview. Thank you very much and a we wish you luck for the end of the championship this weekend in Imola. Kiara: "Thank you very much!". The story of the Ducati brothers. How the company from Borgo Panigale was born and how it transformed into one of the most important motorcycle brands in the world.